Absolute, precise linear measurement is now easy to interface to virtually any industrial control network. 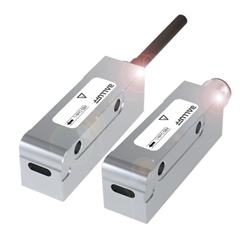 The Balluff BML SL1 absolute magnetic linear encoder with IO-Link provides absolute position measurement, over lengths up to 8 meters, and with position resolution to 1 micrometer. The BML SL1 leverages the power of IO-Link to allow simplified integration of absolute linear position measurement to nearly any industrial control platform. The sensor reports exact position data without requiring additional calculations for resolution or analog to digital conversion. According to Scott Rosenberger, Product Marketing Manager for Balluff's measurement products, the BML SL1 is especially relevant in applications with high sensor density. According to Rosenberger, "Not only does the IO-Link interface greatly simplify the connection to the machine control system, IO-Link also presents opportunities for substantial cost savings by allowing numerous sensors to be connected to one IO-Link master, using standard unshielded sensor cables. Plus, there is no need for dedicated, expensive absolute encoder interface hardware." The BML SL1 is ideal for applications such as linear measurement on X-Y tables, overhead gantries, and any other application where precise, absolute position measurement is required. For more information, visit http://www.balluff.com. About Balluff Inc.: Balluff Inc., the U.S. subsidiary of Balluff GmbH, Neuhausen, Germany, is a leading manufacturer of a wide range of inductive, photoelectric, vision, capacitive and magnetic sensors as well as linear position transducers, RFID systems, and networking products. Balluff products for OEM and factory floor solutions are used to control, regulate, automate, assemble, position, and monitor manufacturing, assembly, and packaging sequences for industries including: metalworking, automotive, plastics, material handling, wood processing, aerospace, alternative energy, medical, electrical, and electronics.